Picnicking is a fantastic British tradition, but to enjoy a good picnic, do a little planning in advance to ensure a perfect occasion. Believe it or not, the most important thing is to take the right equipment. 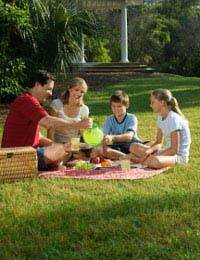 We've created a picnic checklist along with some tasty picnic recipes below. Not everything on our list is essential - you can make your own judgement depending on your picnic setting (e.g.. your destination may already have picnic tables and chairs). Finger or fork food is essential – anything too fussy won't work if you're eating from your lap. If you have a table and chairs, you'll still want to avoid anything that's too tough to cut up especially if using plastic cutlery and paper plates. Pies, pasties or quiches are ideal foods to pack, as are salads with strong flavours but without very liquid sauces as they can drip and spill on picnic clothing. Sandwiches are a perfect choice but make sure they are not too sloppy and take care to make them with good bread that doesn’t break or crumble as you eat it – baguettes, rolls or wraps often work better for picnics than sliced bread. For an exciting twist on classic potato salad simply roast some small salad sized potatoes with salt, olive oil, garlic and rosemary until their skins crisp a little and mix with wholegrain mustard, tarragon and olive oil. Very tasty and not too greasy. Drain a tin of tuna in oil and mix it with minced red onion, some black pepper and barely enough mayonnaise to bind the ingredients together. Tear a few basil leaves and mix them into the mixture before spreading it on the bread. Take along a container of crunchy raw vegetables such as peppers, sliced courgettes or mild radishes for people to insert into their sandwich before eating. Beef tomatoes and avocados -make a delicious dish. Slice them when you get there, layer them alternately on a plate, and gently season them olive oil and seasoning. Black olives, feta cheese and rocket leaves can be combined to make a tasty salad - drizzled with a little extra virgin olive oil. Mix together some mini cherry tomatoes with fresh basil and mozzarella. Add ready cooked chicken and bacon to cold pasta with a dollop of mayonnaise and a sprinkling of chilli powder or cracked black pepper. Nobody wants to be slaving over a hot oven when the weather is sunny, but a lovely sweet can really finish off a perfect picnic. Here’s a no-cook recipe that’s ideal to transport. Line a 20cm square tin with clingfilm. Put the biscuits in a plastic bag and use a rolling pin to crush them. Melt the two chocolates, butter and golden syrup in a heatproof bowl set over a pan of simmering water (or use the microwave). Stir well before removing the bowl from the heat and adding all the remaining ingredients. Pour or spoon the mixture into the tin and level the surface. Leave at room temperature to cool then put in the fridge for an hour to set. If you put it in the fridge while warm, the chocolate will ‘bloom’ and look pale and powdery. Turn the cake out onto a chopping board, peel away the cling film and cut into 12 cubes. Transport in a box with a chiller pack alongside. Alternatively, for a scrumptious dessert, try watermelon cut into chunks, sprinkled with pomegranate syrup and eaten with a fork, or classic fresh strawberries and sugar to dip them in or just a simple bowl of cherries.